VELCRO is one of the most friendly and cuddly cats that you will ever meet! Named Velcro for her preference to “stick” to her humans, this girl is full of life and happiness! She is playful, confident, funny, and sweet. Her favourite hobbies include cuddling on the couch, purring, kneading with her paws, and playing with small toys. If you bend down to pick something up, she will likely jump on your back! She just wants to be close to her humans at all times. When hunting her toys, she often “trills” a sweet little sound that is adorable to hear. Velcro was rescued in January 2017 from a shelter in rural Quebec that was over-capacity by approximately 400 cats. Without enough adoption outlets in the area, these cats had a poor chance of being adopted. 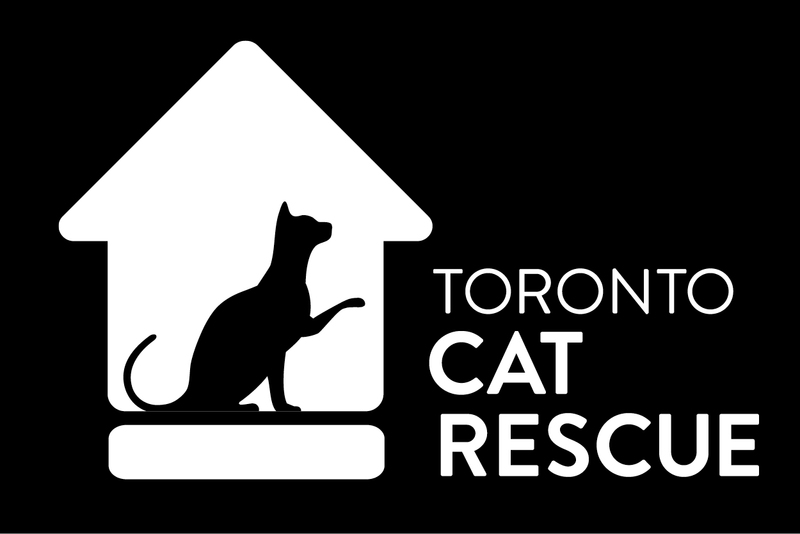 Toronto Cat Rescue stepped in to assist and has already brought almost 100 of these friendly felines to Toronto to find their forever homes in the GTA instead. When Toronto Cat Rescue volunteers took a trip to Quebec to meet the felines, Velcro was one of the first cats to literally jump into their arms! Since all of the cats from the shelter are so incredibly loving, sweet, and starving for human attention, this large-scale rescue was affectionately named “Project Velcro“. Now it’s time for Velcro herself to find her forever home! Velcro has tested positive for Feline Leukemia Virus (FeLV). FeLV affects the feline immune system, which makes Velcro more susceptible to diseases, and means that she might have a shorter lifespan than other cats. She will need to be provided with a nutritionally complete and balanced diet, provided with regular vet check-ups, and monitored carefully for her health. Due to the ability for FeLV to spread easily between cats, Velcro is seeking a single-cat home to live in (or a home with another FeLV positive cat). Velcro has so much love to give and she deserves a very loving home. If you have a big heart and are willing to give this sweetie a chance at her forever home, she has her purrs and cuddle paws ready for you! Adopt her today! *Due to Velcro’s FeLV positive status, an adoption fee of her adopter’s choice is appreciated vs. our standard adoption fee of $175. If you are unable adopt, then please support Project Velcro by making a donation to the cats care!